The fast, easy, and low-cost way to connect a CCTV camera to a monitor, multiplexer, or video recorder. Video baluns allow the video signal of a single CCTV camera to be transmitted long distances over low-cost Cat5e/6 unshielded twisted pair (UTP) cable. They are great for both full-motion color and full-motion monochrome cameras, and increase the flexibility of where such cameras can be mounted. These CCTV baluns also work over existing UTP cabling, making them perfect for use in nearly any building or across an entire campus. 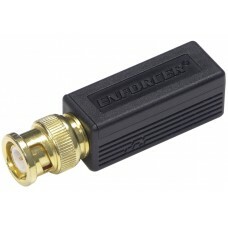 Transmits a monochrome video signal up to 2,000ft (610m) or color up to 1,300ft (400m). Passive operation - No external power required. Uses low-cost Cat5e/6 cable instead of costly coaxial cables. Includes a BNC connector and a terminal block - No need to waste time crimping RJ-45 connectors. High immunity from interference - Built-in impedance coupled device and noise filter. Quick-connect screwless terminal block for easy installation. Gold-plated BNC connector for added reliability and longer life. Small size allows the mounting of multiple baluns behind multiplexor without pigtails.